Crowe is delighted to have sponsored the 2019 Annual Charity Leaders’ Lunch, in association with The Wheel – the fourth such event we have run in this series. 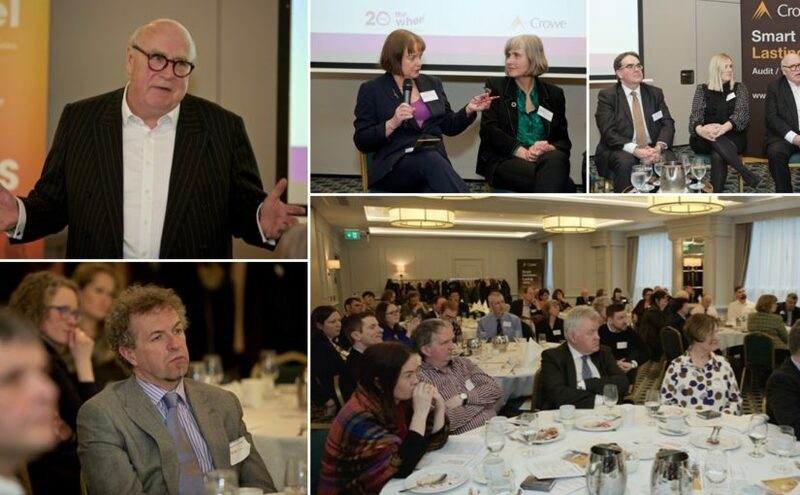 Around sixty charity CEOs, chairpersons and senior executives attended the event in the Davenport Hotel, Dublin. The keynote speaker at this year’s lunch was Sir Stuart Etherington, CEO of the National Council for Voluntary Organisations in the UK (no stranger to the not-for-profit sector in Ireland), who shared with the audience his thoughts and reflections on the current and future challenges facing charities, including such diverse topics as good governance, commissioning and contracting, the strong need for an effective civil society, and the possible impact of Brexit. After Stuart’s speech, a panel discussion provided an opportunity for further exploration of these topics, with the panel consisting of Prof Niamh Brennan, UCD; Deirdre Garvey, CEO, The Wheel; Shane McQuillan, Partner, Crowe; Lisa-Nicole Dunne, CEO, Children’s Medical Research Foundation, Crumlin; and Sir Stuart. We look forward to continuing this dynamic dialogue with our many not-for-profit clients over the weeks to come. To find out how we can assist your charity or not-for-profit organisation with any strategic or financial issues you may be facing, contact: Shane McQuillan, Partner, Consulting or Roseanna O’Hanlon, Audit Partner.